The potential of solar power has been touted for years, yet it has always come with major limitations. The costs of producing solar power have outweighed the benefits for many power companies. But that's changing. Solar power has reached a tipping point, and it's creating a massive profit opportunity for one solar ETF. "Despite the odds, alternative energy – led by solar power – is rapidly approaching what the industry has always considered to be the 'Holy Grail,'" Money Morning's Global Energy Strategist Dr. Kent Moors said. Solar has always been too expensive for most industries to adopt. "New energy projects require intensive amounts of working capital to make them fully compatible with traditional methods of generating power, and there's the widely held assumption that renewables can't survive absent government subsidies and benefits," Moors said. "Grid Parity" is achieved when an alternative energy (like solar) is produced for the same price as purchasing power from the electricity grid. This low price must also be achieved without the help of government subsidies. This is crucial to the success of alternative energy. Residents and power companies will not change their power source if they must pay extra. The 2015 solar outlook by Deutsche Bank expects all 50 U.S. states will reach grid parity by 2016. There has also been the tricky problem of producing power when there is no sunlight. But these problems are quickly fading, thanks to grid parity. "Grid parity reflects renewables' ability to generate power for the same underlying cost as competing sources like oil, natural gas, or coal," Moors explained. "In other words, it's the point at which the cost of generating renewable energy suddenly becomes equal to its peers." 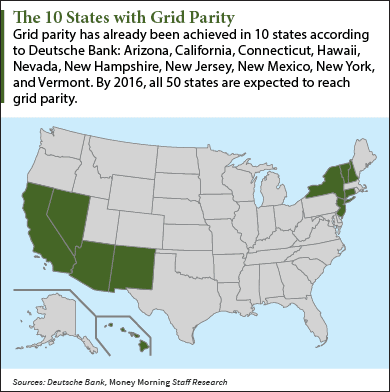 In Deutsche Bank's 2015 solar outlook, analysts noted grid parity had been reached in 10 U.S. states at the end of 2014. All 50 states are expected to reach parity by 2016. By 2017, analysts expect 80% of the global market will have reached grid parity. The same report indicates the price of solar modules should fall roughly 40% within the next four or five years. "We believe the trend is clear: grid parity without subsidies is already here, increasing parity will occur, and solar penetration rates are set to ramp worldwide," the report says. We've already seen the impact. Mother Jones reported in November the amount of solar power produced in the U.S. had leaped 139,000% in the past 10 years. That's created thousands of new jobs. 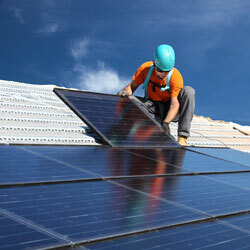 According to the Solar Foundation, there are now 174,000 people employed in the solar industry. By comparison, the number of coal miners, and people involved with coal transportation or coal power plants totaled just 80,000 in 2006. And many coal facilities have shuttered operations since then. The Solar Foundation also says that 1.3% of all new jobs created in the U.S. since 2013 have been from the solar industry. The U.S. Energy Information Administration (EIA) reported solar made up just 0.2% of all energy generated in the U.S. in 2013. So it still has incredible potential for further market penetration. In the U.K., solar power is expected to provide up to 4% of the nation's power by 2020. The price of solar panels has already dropped 70% there in the past several years, the BBC says. But individual solar stocks are very volatile. That's why the best way to profit from the industry now is with a solar ETF. It's a safer play. Plus, you'll be getting exposure to the entire industry, not just one company.